With T-Mobile promising to roll out HSPA 7.2 by years end, and HSPA+ 21Mbps by the middle of 2010, a few lucky residents of Philly have already been blessed with T-Mobile’s ultra fast 3G network. A lucky individual over at jkontherun was kind enough to share his hands-on experience with T-Mobile’s HSPA+, currently live in the Philadelphia area. Using a T-Mobile webConnect USB stick the individual started out and tested T-Mobile’s current 3G network, which resulted in speeds around 1.11 Mbps download and 0.67 Mbps upload speeds. Then the individual used the same hardware in the HSPA+ test network, and noticed speeds noticeably increased, yielding, 5.58 Mbps download and 1.23 Mbps upload. That’s some blazing fast mobile speeds! The individual also tested the HSPA+ network out on the Nokia N900 which supports T-Mobile USA 3G bands. Hit the link below to read the users full hands-on and let us know what you think in the comments! 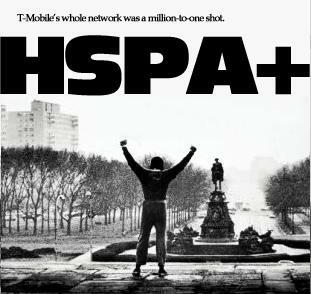 Will all current tmo 3G phones be able to use the HSPA+? for the later HSPA+ (21 Mbps) they’ll have to release newer phones that support such speeds. and a couple of others. The Touch Pro 2 is also 7.2 capable. I just used mobilespeedtest.com on my Bold 9700. I turned the Wi-Fi off, and ran the test (1Mb) it says my speed is 3980kbps. Can that be right? That’s not all that different from being on Wi-Fi. you cant run speedtests using the blackberry browser because of how blackberry transmits the browsers data. you need to use a application to test the speed, or tether the phone to your computer and test it from there. this news are starting to get boring!! is tmobile getting some hot phones for christmas????? anyone getting 3G in Cincinnati yet? How cryptic. Needs moar plox. Speed tests, etc. I have a Blackberry 9700 that averages about 150-200 kilo BITS per second in one of the first cities to get 3G. This is basically litter faster than Edge speeds for people who don’t know. I would worry about get 7.2 functional all over before doing 21..lol…We were one of the first to get 3g and it’s spotty and slow. Manolo: I don’t like AT&T but they are faster than Tmo in MOST cities. I keep Tmo ’cause it cheap. But AT&T can keep their ads..they are correct. Not for long. About another 2 weeks. Or less. Roflmao! Above numbers are avaerage over multiple readings from SpeedTest.net app downloaded from the market and is on a new moto cliq. I’m actually indoors and at work out in the suburbs at the moment where my connection is usually slower. Curious what the test will show when I get home in a few hours! And here we are its Feb, 2010 and I am LUCKY as a mofo if get 500kb downlink in Phoenix Arizona….Retarded. Thats on a Nexus One by the way.